Natural grass fires are evidently more important for the ecology of savannahs than has previously been assumed. This is the finding of a study carried out in Etosha National Park in the north of Namibia. It is the first study to have investigated the complex interplay of the factors fire, competition, moisture and seed availability in relation to a grass species. Periodic fires in semi-arid regions can lead to older tufts of grass disappearing, thereby making room for younger grasses. Writing in the Journal of Ecology, the researchers from the Helmholtz Centre for Environmental Research (UFZ), the University of Frankfurt am Main and the University of Cologne say that fire therefore plays an important role in regeneration. The findings are particularly significant for the management of semi-arid nature reserves, in which, in the absence of natural plant eaters, fires are the only practical means of renewing the grass canopy. 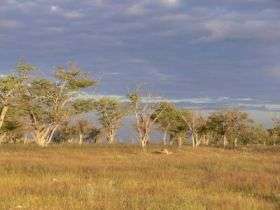 For the study, the researchers selected an area measuring 500 by 500 metres in Etosha National Park because it has one dominant grass species and because it was possible to rule out interference such as grazing and other human influences. Etosha National Park in the north of Namibia is the second largest nature reserve in Africa, measuring 20,000 square kilometres. The temperatures in the semi-arid savannah fluctuate between 6 degrees centigrade in the winter and 35 degrees in the summer. The area under investigation is one of the driest areas in which plants can still grow, with annual rainfall of just 380 mm. That is less than the rainfall in the rain shadow of the Harz mountains. Stipagrostis uniplumis is the dominant grass species and lives for several years. The researchers observed the growth of these grasses at weekly intervals for one season and measured the most important climate parameters. They also experimented on small areas by sowing additional seeds, carrying out controlled reconstructions of fires, planting competing grass species and using artificial irrigation. They found that the dead grass layer significantly hindered the recruitment of young plants. Fire can break up the old grass layer, thereby creating opportunities for regrowth. By contrast, artificial irrigation and the addition of seeds did not result in higher recruitment of seedlings. The largest ever conference of ecologists from all over Europe was taking place in Leipzig from 15 to 19 September 2008. Over 1000 participants from more than 30 countries have registered for EURECO-GFOE 2008. The conference is a joint meeting of the European Ecological Federation (EEF) and the Gesellschaft für Ökologie (GfÖ) and is being organised at the Congress Center Leipzig by the Helmholtz Centre for Environmental Research (UFZ) and the Universities of Halle-Wittenberg and Leipzig. The EEF is the umbrella organisation of the national ecological associations in Europe. Over 8000 ecologists belong to its member associations. The GfÖ is the ecological society of Germany, Austria and Switzerland. Early civilisations worked this out millenia ago. Who paid for their research? Although this is interesting,it's not new.Native Australians have been doing controlled burns for thousands of years. Who paid for their research? No doubt the same person who paid for your.